An interview was scheduled after the “Hard Hats & High Heels” event in 2015 with Brandchannel.com. 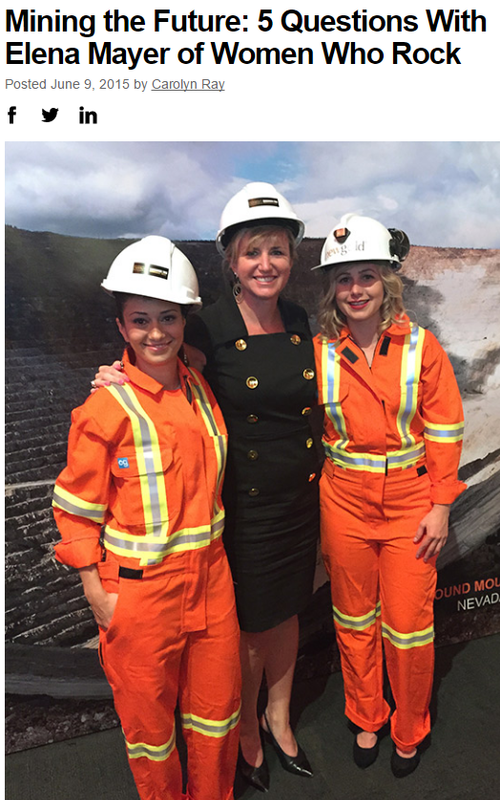 CR: Elena, why does the mining industry need more women? EM: Increasing the representation of women in the sector will provide a solution for skilled worker shortages through access to a larger talent pool. As the sector becomes increasingly complex, technical skills and strong grasp of the underlying business drivers are necessary, but no longer sufficient. It is the understanding of cultural, political and social realities of host countries—as well as collaborations with local governments and communities—that often determines the success of projects. For the complete article, please visit Brandchannel, and “Mining the Future: 5 Questions With Elena Mayer of Women Who Rock”.